The pilot of the lead A-10 Thunderbolt II raised his visor for a moment, rubbing his eyes. He and his wingman — WARLORD flight — had been airborne for three hours. Nearing the end of their mission, he shot a quick glance at his fuel state. Another twenty minutes on station, then enough to get back to base and have a little bit to spare. His wingman had already canceled their tanker; they hadn’t seen any action, so there was no need to take on extra gas. “Two,” came back the response. 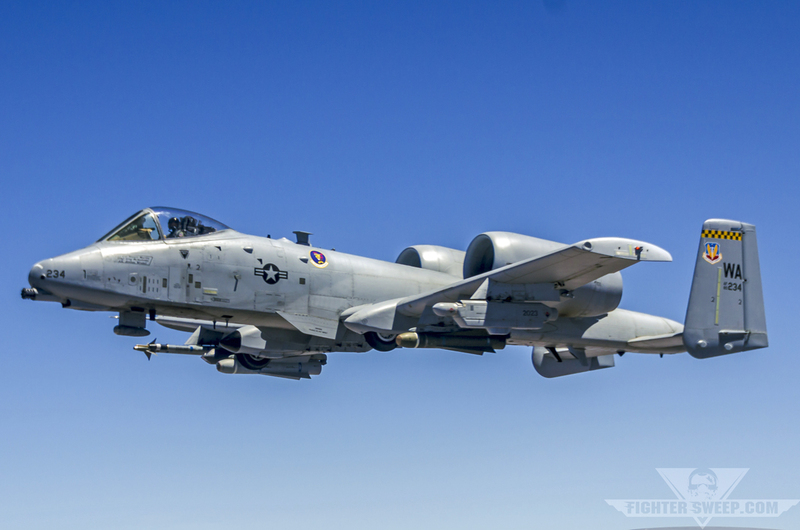 A Republic A-10C Thunderbolt II from the 66th Weapons Squadron waits for his wingman to get fuel before returning to the fight during a CAS training mission. The sun was now low over the horizon to the west. It would be dark by the time they got back to their base, so the pilot of the lead aircraft, “Oiler” to his friends, reached back and grabbed his helmet bag, bringing it forward. He popped the visor off of his helmet and then snapped the night vision goggle adapter plate into place. He set the NVGs in his lap for now and stowed the bag. The preceding was the beginning of a real incident. Such engagements are still very commonplace in downrange, representative of the type of power projection being implemented by coalition air forces–and on a grand scale. While it is true that there are no dogfights taking place in the present conflicts, in no way has that minimized the role of airpower, or the frequency with which attack and strike fighter aircrews are called upon to employ their craft. Close Air Support, or CAS, has been a reality of air warfare since World War I. The parameters of that type of operation are unchanged: troops on the ground with the means to communicate with aircraft direct weapons employment from the air, thereby helping them break contact with the opposing force, or to assist in the accomplishment of the ground unit’s objectives. But through the course of history, the need arose for a formalization of training in that discipline in order to increase effectiveness, and to increase the number of lives saved. 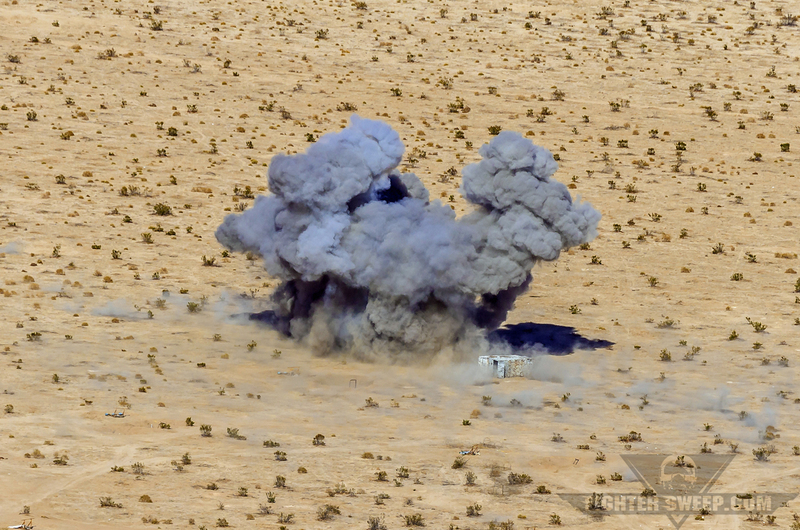 A GBU-12 laser-guided bomb, dropped from an F-16C, impacts a structure at Fort Irwin, CA during a Green Flag-West mission. In 1981, the United States Army began a series of very sophisticated and realistic mock combat exercises at its National Training Center, located at Fort Irwin, California. From the onset, the Army had asked the Air Force for close air support missions and a tactical control system to support the undertaking. “Air Warrior” was created to teach aircrews traditional air support and interdiction skills against a conventional enemy ground force. It pitted dedicated ground-attack and strike assets against large troop formations during mock battle at the NTC. Once the program was proven and both services recognized the value of the joint training, the exercise began to incorporate training for Tactical Air Control Party members into a single structure that allowed all participants to train together as they would end up fighting in a real conflict. Instruction in irregular warfare skills were added to the curriculum over time, including the use of airpower in counterinsurgency and urban operations; non-traditional intelligence, surveillance, and reconnaissance; as well as the employment of precision-guided munitions and advanced targeting systems. New technologies being fielded on aircraft were being used to locate insurgents and search for improvised explosive devices. The use of satellite, digital communications links, and live video feeds from air systems were also brought into training as they proved to be transformational in the way that air-ground operations were being conducted. Air Warrior was renamed “Green Flag” in 2006. The name change acknowledged the key role of air-ground capabilities in contemporary conflict as well as the growing importance of the exercise, run ten times annually from Nellis Air Force Base and Fort Irwin in the west, and Barksdale Air Force Base and Fort Polk, both in Louisiana, in the east. Green Flag-West provides a realistic close-air support training environment for Airmen and Soldiers preparing to deploy to Southwest Asia. It is a totally unscripted battle exercise, which provides units with training on a scale not available at or near their home stations. Participating aircrews, working closely with the Joint Terminal Attack Controllers embedded with the Army, fly missions to support thousands of soldiers who are engaged against an opposing enemy force in a 1,000-square-mile combat environment similar in climate and terrain to what they would encounter overseas. In order to create the most realistic environment possible, the Department of Defense has brought in Hollywood set designers to make the villages at Fort Irwin look exactly like they would in the deployed area of responsibility, or AOR. To take it a step further, role-players have been hired to participate. These are people from Iraq and Afghanistan originally, and their charge is to dress, speak, conduct business, and live as they would back home. At any given moment, there are as many as 5,500 actual troops and 1,700 “force multipliers” between the opposing force, the role players, and those maintaining the combat outposts at NTC. 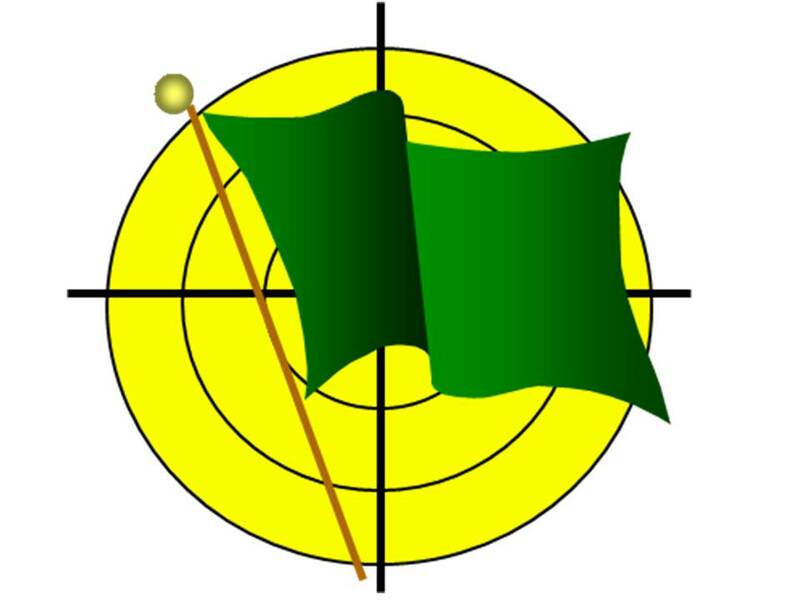 In the next part, FighterSweep takes a look at the planning and execution of Green Flag and how important it is for the Army and Air Force to have a symbiotic relationship in the real-world Area Of Responsibility (AOR). Stay tuned! Scott Wolff is an accomplished writer and renowned aviation photojournalist. He has held the position of Managing Editor for a print flying lifestyle magazine, and is the Host and Editor for FighterSweep. Scott's area of expertise is military flight operations, drawing on ten years of experience working extensively with all branches of the armed forces. He holds an FAA pilot certificate, the culmination of a life-long passion for flying airplanes. Scott has received military altitude chamber training, emergency egress training, and has logged time in a variety of civilian and military aircraft. He is also a member of the International Society of Aviation Photographers and Nikon Professional Services. Green Flag: Lives on the line! Dogfight! F-16V Viper versus J-39E Gripen: Who Wins?